Two years after the Boston Marathon bombings, Dzhokhar Tsarnaev has been convicted and now faces sentencing. Many voices have weighed in on how Tsarnaev should be punished: some have called for him to be sentenced to life imprisonment while others call for his execution. I respect the effort to articulate "The Traditional Case for Capital Punishment." By citing the textual authority of Augustine, Aquinas, Charles Borromeo, Saint Paul, and Pius XII, it is true a case can be marshaled in favor of allowing the state to execute criminals. I do not believe, however, this argument to be compelling. For while it is true that Aquinas wrote that it is "praiseworthy and advantageous that [a criminal] be killed in order to safeguard the common good," this was in recognition that certain persons could prove "dangerous and infectious to the community, on account of some sin." (ST, IIa-IIae 64.2) The question redounds to contagion: can a criminal be sufficiently contained so as to preserve the health of the community? My argument for the abolition of the death penalty takes a different tack. What is most frightening about zombies is that their insatiable hunger. They feed upon living flesh for no other reason than to feed. Zombies do not, as we do, eat in order to live. Indeed, there is no why at all. Instead they shamble across the land, devouring the living and creating, by their bite, another agent of death's army. Zombies are Death-Dealers: death begetting death begetting death. Unlike other figures in horror - Freddy Kruger, Jason, even Dracula - there is no sense to why they kill. Freddy and Jason seek revenge, Dracula needs to drink the blood of the living. Zombies have no such purpose. On one level, then, to execute a criminal is simply to add another body to the graveyard of history. Killing Tsarnaev will not restore any victim to life, nor will it lead to the regrowth of any severed limb. It will bury a tragically flawed young man next to those whose lives he helped to destroy. Depriving someone of life isn't a punishment, really, because there is no one left to punish: once a person is dead, it's over (at least in this lifetime). Victims are still victims and while it is true that "ultimate justice" has been exacted, I find it incomprehensible that his death is going to make putting on a prosthetic leg any easier. In this above article, Father McCloskey writes, "St. Thomas finds frivolous the argument that murderers should be allowed to live in hopes of their repentance, questioning how many innocent people should have to suffer death while waiting for the guilty to repent." Now, it would be helpful if he would have given a citation for this - it's always interesting to find places where the otherwise dispassionate Aquinas deems things things "frivolous." Elsewhere, Aquinas (IIa-IIa 108 a. 3, ad.2) does say "But penalties in this present life have more of a healing character. Consequently, the death penalty is only given as regards those transgressions which present enormous perniciousness to others." Again, this raises the issue of containment: to the extent that the state can sufficiently contain the contagion of a criminal, there is no reason to execute said criminal. The medicinal nature of punishment should be born in mind: it is medicinal and aimed at correcting what is wrong. As a Catholic, I find the death penalty offensive because it only perpetuates a cycle of violence, because it is unnecessary as we have the means to prevent a spread of criminal contagion, and because executing a person is an abandonment of hope. For Aquinas, hope is the virtue looks toward a "future good, difficult but possible to obtain" either through one's own efforts (I hope to run a marathon by training) or through God's grace (I hope to be the priest God's people deserve but know I can't do it without grace). In this latter case, of a hope empowered by God's grace, we can consider the possibility of a future repentance by Tsarnaev. As a man of faith, I believe that the Eternal Word became flesh in Jesus Christ, that Christ conquered death, that simple and tasteless bread and wine can become the Body and Blood of Christ, and that sins can be forgiven. Even the hardest of hearts, given time and sufficient grace, can be softened and turned by the One who called all of Creation into existence. If Tsarnaev can be contained safely, then it is a crime against Hope itself and a failure of trust in God's power to call for his death. Such hope is not at all frivolous. It is faith. A world organized according to the logic of Zombie Justice is a world where death rules supreme. Death perpetuates death as the wheel of violence, or justice, turns again and again. Inasmuch as we are able to contain a criminal, we must stay the executioner's hand: we can prevent further violence. For those who profess faith in the Christ who conquers death, we are given a glimpse of a pathway beyond retributive violence. 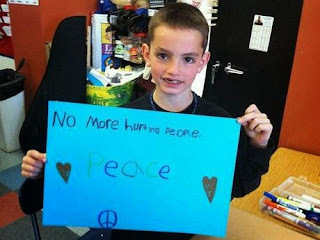 This, I believe, the youngest of Tsarnaev's victims understood. Little Martin Richard. We do not need to hurt people, to inflict further damage. We can break the cycle of violence not with more violence but with what the Risen One offers: Peace.